I hope you’re having an amazing Monday! I am just going to jump right in and tell you all about a life saving face product for oily complexions that I discovered over the weekend. If you have oily skin, you need this product in your life! My face is usually normal to oily, but with the humidity lately, my makeup has seriously been sliding off my face the second I put it on! 😦 I tried everything from changing my face moisturizer and face primer to changing my foundation and setting my liquid foundation with lots of powder (which I hate doing) and then using a makeup setting spray, but nothing was working, until… a Ulta employee recommended a face primer I would NEVER have tried on my own. 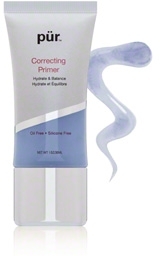 It is called ‘Correcting Primer Hydrate and Balance’ and it is made by Pur Minerals. I have tried a few different products from the Pur Minerals line, but nothing really wowed me where I thought their products were great so when the Ulta employee recommended the ‘Correcting Primer Hydrate and Balance’ made by Pur Minerals I really didn’t have high hopes. I didn’t like the texture when I tried it on my hand in the store and I didn’t think it would help my oily complexion or help my makeup stay in place as this face primer didn’t feel like all of the other primers I have tried, but I am so glad I ended up purchasing this face primer as it is honestly a face saver. This face primer has a gel texture to it and is oil-free and silicone-free. I am used to face primers having silicone in them which gives a lot of ‘slip’ which is why I was originally turned off by the Pur Minerals primer (it just didn’t feel like all the other primers). The Ulta employee explained that oily skin is actually dehydrated skin which needs balanced hydration and that the Pur Minerals primer would provide everything my oily face needed to mattify my makeup while giving my skin the hydration it needs, so I bought it. When I tried this primer the next day, I was shocked by how amazing this product worked on my oily skin. The gel texture was really cooling and just glided over my freshly moisturized face, preparing my skin for my liquid foundation. When applying foundation, the primer seemed to grab it and help lock it into place instead of sliding off my face which was happening before. I didn’t even have to use setting powder or spray; I just finished my makeup adding bronzer and blush over the foundation and my face looked flawless ALL day. What I really loved most about this face primer is that even though it is mattifying, it didn’t make my face look or feel too dry and matte, it just took the access oil away and my skin looked normal and fresh. If you have normal to oily skin or really oily skin, I highly recommend Pur Minerals ‘Correcting Primer Hydrate and Balance’. I do not think it is suited for dry skin, but again, my skin is oily so I cannot make a fair recommendation for dry skinned babes out there. I also only recommend this face primer as a makeup primer as I saw the amazing results as I was applying my makeup so I do not think it is intended to mattify bare skin on its own without adding some sort of makeup over it. This primer is definitely a life saver to me and I highly recommend it to anyone who is struggling with an oily complexion that wants their makeup to stay in place all day. I haven’t been this impressed with a face product in a very long time. Finally, there’s a primer for irritable, breakout-prone skin! The first oil-free, silicone-free primer of its kind, Pür Mineral’s mattifying makeup primer features an intensely clarifying blend of salicylic acid, calming lavender extract and Pür Mineral’s proprietary Ceretin Complex in a soft, hue that offsets the look of blemishes. It also includes Pentavitin, which provides instant moisture with up to 72 hours of deep hydration. Smooth on clean moisturized skin. Allow to dry, and then follow with Makeup. Aqua, Glycerin, SD Alcohol 40, Acrylates/C10-30 Alkyl Acrylate Crosspolymer, Saccharide Isomerate, Salicylic Acid, Polyquaternium-7, Lavandula Angustifolia (Lavender) Flower/Leaf/Stem Extract, Agave Rigida (Sisal) Extract, Scleroglucan, Retinol, Ceramide AP, Butyrospermum Parkii (Shea) Butter, Lactic Acid, Sodium Starch Octenylsuccinate, Bentonite, Sodium Acrylate/Sodium Acryloyldimethyl Taurate Copolymer, Polysorbate 80, Triethanolamine, Isohexadecane, Disodium EDTA, Phenoxyethanol, Ethylhexylglycerin, Blue 1 (CI 42090), Red 33 (CI 17200). I think using natural face washers before using the makeup primer can also go along way in making it more effective.